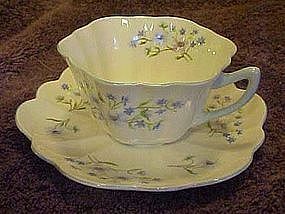 Shelley Blue Rock Dainty cup & saucer in the Cudlow shape. Bone china. England. c. 1945-1966. The famous Dainty shape relief molded with six deep flutes. White ground with Blue Rock floral transfer (one on cup interior), water green (looks more light blue than green) edges & handle. A very popular Shelley pattern on the most popular Shelley shape. CONDITION: Excellent!